Monster Hunter World's long-awaited 8-bit-inspired Mega Man Palico gear is coming soon. Capcom today announced the gear will finally be available starting April 13th. Tickets to craft the gear will be distributed during the game's Spring Blossom Festival from the 13th through the 27th. When hunting with a Mega Man Palico, you can listen to classic NES Mega Man tunes which changes depending on your weapon type. Mega Man Palicos also feature their own unique Blue Bomber-inspired taunts and moves, like chugging E-Tanks to replenish health. You can see the Mega Man Palico in action here. Monster Hunter World is now available on PlayStation 4, Xbox One and PC-bound later this year. Ugh, that looks like trash. Nah, I will pass. That looks like trash and ugly. UGH! Compared to the Street Fighter and DMC stuff in the game, this just looks a bit... off. Mostly just the helmet/head though. Can we just bloody-well not? I mean, I'm sure there's an audience, for this style of gimmick. But, who? 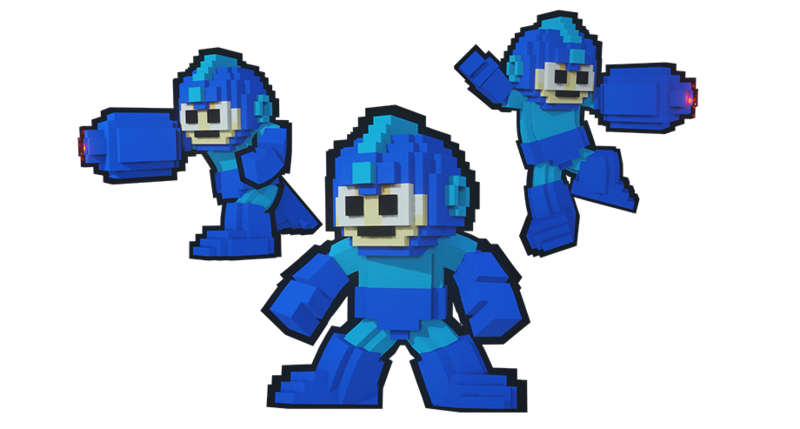 Why not just make the costume a regular ol' 3D Megaman? Why does it always have to be this "8-bit" (a grossly irrelevant term, I might add) stuff? Bit of a harsh reception, if you haven't seen the footage of this mega-palico in motion I'd recommend it, looks pretty cool when you see it in game compared to a still image. I think it still looks awkward in motion, but very largely just due to the face, which is easier to ignore when you're actually in game. Those eyes have seen some things, man. Please, no more 8-bit it's been done to death.